You'll have to wait until the 6th of November to claim it, though. To celebrate GTA Online's fourth anniversary—when you remember that it was first released on PS3 and Xbox 360 back in 2013—Rockstar is giving every player GTA$400,000 for logging in to the game up until the 6th of November. The cash will then be deposited straight into players' bank accounts between 6-13th November, so there are no worries about someone running you over and taking your lovely pile of money. I think this is a cool, generous move. In Shark Card terms, that's roughly £5/$6 worth of in-game money, which will get you a nice car, or make it a bit easier to acquire a hangar for the Smuggler's Run expansion. It's a smart way of bringing people back to GTA Online if they've not tried it for a while. You can also get three Halloween-themed t-shirts for free when you sign in this week. Until 30 October, Transform Races pay double $GTA and experience, too, and you can also get the same bonuses in Condemned mode until November 6. 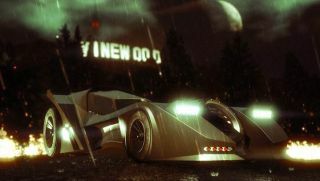 Finally, from today players can buy the Vigilante, GTA's version of the Batmobile, pictured at the top. It's not cheap—it'll set you back $3,750,000, which is just over £31/$40 worth of Shark Cards in real money. It's a real willpower test for those of us who really like Batman, though.